The life and long career of renowned Khyal vocalist Pandit Omkarnath Thakur (1897-1967), or Pujya Pandit Shree Omkarnathji Thakur as the record label at right would have it, is documented colorfully elsewhere. Born in poverty, he eventually spent years in Pandit Vishnu Digambar’s music school in Bombay, and became the principal of a music school by age 20. By ca. 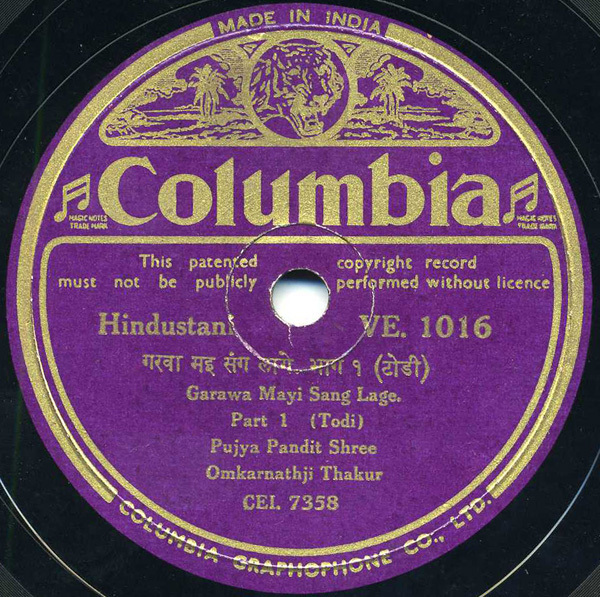 1934-1935, when this record was pressed in India, he was already recording masterworks. Blessed with, according to legend, his father’s “precious mantra” written on his tongue, Thakur’s vocal style is immediately dramatic. He improvises and modulates his voice on lyrics and syllables in an almost dizzying fashion (most apparent in Part 2 of today’s post), known as bol taan in Indian classical music. This well-known track was most likely released decades ago on LP – it was also released on a hard to locate Indian CD titled “Golden Milestones” but as far as I can tell, the sound quality on that CD is quite poor. Therefore, I offer both sides of this fine performance here. For more Thakur music on the web, check this post on Mehfil-E-Mausiqi. He is a mile ahead of all the existing pandits with unfathomable depth. My god, that is INCREDIBLY beautiful! it’s out of this world!! !no words to describe it’s beauty.I got goose bumps! !thanks for sharing. Can someone give me the contact of the Gandharva Sangeet Mahavidyalaya established by Pandit Omkarnath Thakur to perpetuate the style of Pandit Vishnu Digamvar? Please give me the contact of Gandharva Mahavidyalaya Music College established by Pandit Omkarnath Thakur. Please correct the last name. Sorry for the typo. Absolutely incredible in every way! This is talent at it’s best!